Honeymoon Offer – Stay for your Honeymoon and save up to 70% off for your spouse per night. Please contact us for further details. The paradise island of Dhidhoofinolhu is the home of LUX* South Ari Atoll Resort, Maldives where 2 miles of the finest sand, a crystal-clear lagoon and views of stunning beauty wherever you look combine to create paradise. The resort has villas on the beach or over water on stilts and you can choose between sunrise or sunset-facing accommodation. Palm-thatched beach pavilions or more sophisticated villas with private pools; whatever style you select, the luxurious bathrooms, spacious, airy interiors and unbelievably comfortable beds will make you feel utterly spoilt. Should you manage to tear yourself away from your villa, the resort boasts diving, spa therapies, two infinity pools, tennis, a cinema and a wide choice of bars and restaurants to ensure everybody finds their holiday dreams coming true. Snorkel in the crystal waters, watch the colony of whale sharks, follow dolphins as they play in the ocean and try flyboarding for a really amazing experience. 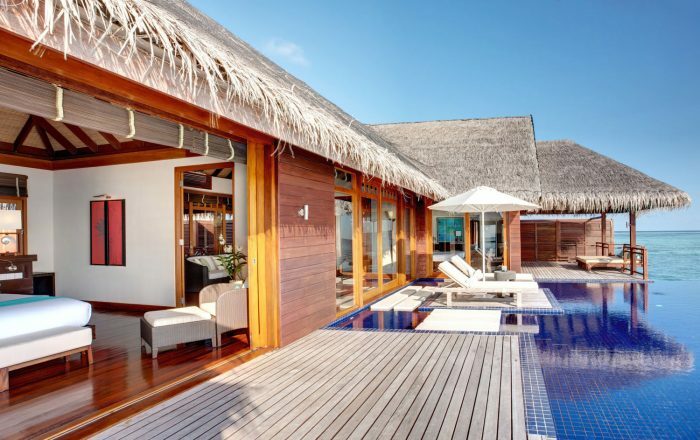 Whether you want to spend your time sailing across the ocean to visit remote atolls, swimming and diving amid the tropical sea life or simply lazing by one of the pools, you will find the time passes effortlessly with the attentive staff on hand to care for your every need at the LUX* South Ari Atoll Resort. Free Nights Offer – Applicable stays – 7 nights for the price of 5, 10 nights for the price of 7 & 12 nights for the price of 8. Honeymoon Offer – Stay for your Honeymoon and save up to 70% off for your spouse per night. Seven restaurants and five bars, each with their own atmosphere and individual themes. Spa and Wellness centre; yoga, meditation and nutritional advice are all available alongside signature massage therapies and Chinese medicine treatment. Two large swimming pools, infinity edged. PADI diving centre offering dives around the reefs in one of the best diving sites in the world. Professional staff will assist beginners and experts alike to enjoy the vibrantly coloured undersea world. Flyboarding, Hoverboarding, paddleboarding, jet skis, wakeboarding, waterskiing and windsurfing are among the water-based activities available. Sailing; choose from catamaran excursions, fishing trips or, for something different, try Topcat sailing in the azure ocean. Children are invited to have fun at PLAY, where the staff will help them learn about the environment and wildlife of the Maldives and younger guests can also take part in sports and games under the care of the dedicated team. Studio 17 is especially for teenagers to escape the ‘old folk’ and hang out in their own club. Learn the local language, dance, take part in beach sports or go on an island adventure. No over-17’s allowed! Cinema Paradiso has regular screenings in the open air. Settle in a beanbag, munch on popcorn and enjoy an evening at the cinema tropical-style. LUX* South Ari Atoll has a tree for guests to hang their wishes upon and leave them for the Maldivian magic to work its spell. Honeymooners, starting their lives together, will want to take part in this custom and then maybe return on special anniversaries to remember the beautiful time they spent here. The restaurants and bars in this resort each have their own special ambience; try the overwater stalls in the market-styled venue for a truly unique take on traditional dining, or spend a magical afternoon at the Veli bar overlooking the lagoon and pool as you soak up the sun together. For a way to completely become one with the Maldivian atmosphere, let the experts at the spa massage your body with sensuous oils then try a yoga or meditation session to leave you feeling refreshed throughout. When night falls, East Bar has a decked pontoon with double swinging seats; what could be more romantic than counting the stars and seeing the moon’s reflection on the shimmering water?Oh, and for a last surprise…there’s an undersea themed area for music and dancing but it’s well hidden…a secret venue well worth seeking out to sway in your partner’s arms as the music works its magic on you both. The twelve restaurants and bars at LUX* South Ari Atoll Resort, Maldives will leave you utterly spoilt for choice. Each has its own ambience and specialities; reggae music, fine roasted coffee, music under the stars and expertly prepared sushi – here is a selection of the venues which the resort boasts. Mixe – Dine on the beach under palm-frond roofs. Buffet breakfasts and lunches feature live cooking stations. In the evening enjoy live music with your meal. Senses Restaurant – Taste freshly cooked Middle Eastern and local dishes served in a beautiful setting overlooking one of the swimming pools. East Market – This is a restaurant like no other. It is themed as an interactive market with a range of stalls located on the water. Noodles, stir-fries and other Oriental specialities are served along with classic European fare beginning each morning with tempting croissants and pastries to start your day in this unique market venue. Allegria – Here the style is thoroughly Mediterranean. Pizzas, gnocchi, seafood and à la carte dishes are prepared in the open kitchen to the highest standards. Umami – This sushi restaurant is as much about watching the expert knife work of the chefs as tasting the exquisite food. Dishes are complemented by an extensive selection of sakés and Japanese whiskies. Beach Rouge – Feel the sand under your feet, gaze over the blue lagoon and enjoy beautifully created pizzas in this idyllic venue. Lagoon Bar – The perfect hang out spot to relax on the beach to the reggae music and enjoy a drink or two.